The Obama Administration should be prepared to take, in quick progression, three important initial steps to trigger a speedy rapprochement with Cuba: immediately phase out the embargo, free the Cuban five, and remove Havana from the spurious State Department roster of nations purportedly sponsoring terrorism. These measures should be seen as indispensable if Washington is to ever mount a credible regional policy of mutual respect among nations and adjust to the increased ideological diversity and independence of the Latin American and Caribbean regions. Washington’s path towards an urgently needed rehabilitation of its hemispheric policy ought to also include consideration of Cuba’s own pressing national interests. A thaw in US—Cuba relations would enhance existing security cooperation between the countries, amplify trade and commercial ties, and guarantee new opportunities for citizens of both nations to build bridges of friendship and cooperation. For this to happen, the Obama Administration would have to muster the audacity to resist the anti-Castro lobby and their hardline allies in Congress, whose Cuba bashing has no limits. Nevertheless, it is time to replace belligerency with détente. This essay argues that the embargo against Cuba is blatantly counterproductive, immoral, and anachronistic. If the initial purpose of this measure was to punish Havana for expropriating U.S. property and to bring about fundamental political and economic reforms, Washington has had more than 50 years to see that the status quo is flawed. Over the years, invasion, embargo, and covert psychological operations against Cuba have only served to reinforce a ‘circle the wagons’ mentality in Havana. The island also has been subject to a relentless barrage of propaganda and terrorist assaults organized by militant anti-Castro zealots to advance their cause. These attacks include the 1997 bombing of three hotels in Havana which resulted in the death of Italian tourist Fabio Di Celmo, and the deadly 1976 downing of a Cuban civilian jet. Rather than succumbing to pressure, all of these incidents have given the majority of Cuban nationals good reason to raise defensive barricades in the face of repeated threats to the survival of their homeland. Besides being counter-productive, there are also strong moral arguments for ending the embargo. From a utilitarian point of view, the policy is objectionable because it has brought about needless suffering without convincing evidence of praiseworthy results. One illustration of this is what happened during what Havana calls the “special period in time of peace.” This refers to the economic crisis, hydrocarbon energy shortages, and food insecurity that followed the collapse of Soviet Bloc (1989 – 1991) which was Cuba’s main trading partner and the source of vital subsidies. The embargo took an especially harsh toll during the special period. According to a 1997 report Denial of Food and Medicine: The Impact of the Embargo on Health and Nutrition in Cuba by The American Association for World Health: “the U.S. embargo of Cuba has dramatically harmed the health and nutrition of large numbers of ordinary Cuban citizens.” The report also observed that “the U.S. embargo has caused a significant rise in suffering-and even deaths-in Cuba.” The special period, including a serious food shortage in 1993, did not lead to the country’s surrender, but to the decisive restructuring of the agricultural sector, a number of economic reforms, and the diversification of trade. The embargo, then, has harmed those whom it purportedly meant to benefit–the average Cuban. A benevolent foreign policy towards Cuba would collaterally seek to benefit the Cuban people, not bring hunger, hardship, and in some cases death to an innocent civilian population. Since it is unlikely that the majority of Cubans would willingly impose such adversity on themselves or their kith and kin for over fifty years, such a punitive and coercive measure fails another important test of moral acceptability. In addition to being counter-productive and immoral, U.S. policy towards Havana is also anachronistic. During the excesses of the cold war, the U.S. sought to use harsh and unforgiving measures to isolate Cuba from its neighbors in order to limit the influence of the Cuban revolution on a variety of insurgencies being waged in the region. That narrative did not sufficiently recognize the homegrown causes of insurgency in the hemisphere. Some argue that it inadvertently drove Cuba further into the Soviet camp. 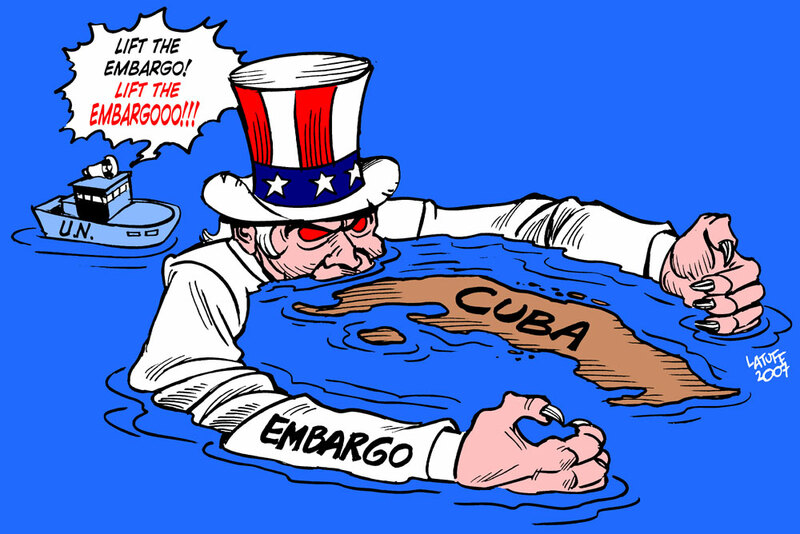 Ironically, at the present juncture of world history, the embargo is in some ways isolating the U.S. rather than Cuba. Washington is often viewed as implementing a regional policy that is defenseless and without a compass. At the last Summit of the Americas in Cartagena in April 2012, member states, with the exception of Washington, made it clear that they unanimously want Cuba to participate in the next plenary meeting or the gathering will be shut down. There are new regional organizations, such as the Community of Latin American and Caribbean States (CELAC), that now include Cuba and exclude the U.S. Not even America’s closest allies support the embargo. Instead, over the years, leaders in NATO and the OECD member nations have visited Cuba and, in some cases, allocated lines of credit to the regime. So it was no surprise that in November of 2012, the United Nations General Assembly voted overwhelmingly (188 – 3), for the 21st year in a row, against the US embargo. Finally, while a slim majority of Cuban Americans still favor the measure, changing demographics are eroding and outdating this support. As famed Cuban Researcher, Wayne Smith, the director of the Latin America Rights & Security: Cuba Project, at the Center for International Policy, points out, “There are now many more new young Cuban Americans who support a more sensible approach to Cuba” (Washington Post, Nov. 9, 2012). Despite the basic intransigence of US policy towards Cuba, in recent years, important changes have been introduced by Havana: state control over the economy has been diminished; most travel restrictions affecting both Americans and Cubans on the island have been lifted; and the “group of 75” Cuban dissidents detained in 2003 have been freed. Washington has all but ignored these positive changes by Havana, but when it comes to interacting with old foes such as those of Myanmar, North Korea, and Somalia, somehow constructive dialogue is the order of the day. One reason for this inconsistency is the continued opposition by the anti-Castro lobby to a change of course by Washington. The anti-Castro lobby and their allies in the US Congress argue that the reforms coming out of Havana are too little too late and that political repression continues unabated. They continue to see the embargo as a tool for coercing either more dramatic reforms or regime change. It is true that the reformist tendency in Cuba does not include a qualitative move from a one party system to political pluralism. Lamentably, Cuba reportedly continues to use temporary detentions and the occasional jailing of non-violent dissidents to limit the parameters of political debate and total freedom of association. The authors agree that no non-violent Cuban dissident should be intimidated, detained or jailed. But continuing to maliciously turn the screws on Havana has never provided an incentive for more democracy in any sense of the word nor has it created a political opening into which Cuba, with confidence, could enter. The easing of tensions between Washington and Havana is more likely to contribute to the evolution of a more democratic form of socialism on the island, the early stages of which we may presently be witnessing. In any case the precise form of such change inevitably should and will be decided in Cuba, not in Washington or Miami. To further moves towards rapprochement with Cuba, the U.S. State Department should remove the country from the list of state sponsors of terrorism. It is an invention to depict Havana as a state sponsor of terrorism, a charge only levied by the State Department under pressure from Hill hardliners. As researcher Kevin Edmunds, quite properly points out: “This position is highly problematic, as the United States has actively engaged in over 50 years of economic and covert destabilization in Cuba, going so far as blindly protecting wanted terrorists such as Luis Posada Carilles and Orlando Bosch, both former CIA agents accused of dozens of terrorist attacks in Cuba and the United States ” (Nov. 15, 2012, Kevin Edmonds blog). It was precisely the propensity of some anti-Castro extremists to plan terrorist attacks against Cuba that urgently motivated the infiltration of such groups by the Cuban five as well as the close monitoring of these organizations by the FBI. Another gesture of good will would be for the White House to grant clemency to the Cuban five: Gerardo Hernandez, Ramón Labañino, Fernando Gonzalez, Antonio Guerrero and René Gonzalez. They are Cuban nationals who were convicted in a Miami court in 2001 and subsequently sentenced to terms ranging from 15 years to double life, mostly on charges of conspiracy to commit espionage. Despite requests for a change of venue out of Miami, which at first was granted and later denied, the trial took place in a politically charged Miami atmosphere that arguably tainted the proceedings and compromised justice. Supporters maintain that the Cuban five had infiltrated extremist anti-Castro organizations in order to prevent terrorist attacks against Cuba and did not pose any security threat to the United States. It would be an important humanitarian gesture to let them go home. Perhaps such a gesture might facilitate reciprocity on the part of Cuban authorities when it comes to American engineer Alan Gross who is presently being detained in a Cuban jail. There would probably be a political price to pay by the Obama administration for taking steps towards reconciliation with Havana, but if Obama’s election to a second term means that there is to be a progressive dividend, surely such a dividend ought to include a change in US policy towards the island. Mirabile dictu, the Administration can build on the small steps it has already taken. Since 2009, Washington has lifted some of the restrictions on travel between the US and Cuba and now allows Cuban Americans to send remittances to relatives on the island. The Cuba Reconciliation Act (HR 214) introduced by Representative Jose Serrano (D-NY) on January 4, 2013, and sitting in a number of congressional committees, would repeal the harsh terms of the Cuban Democracy Act of 1992 and the Helms-Burton Act of 1996, both of which toughened the embargo during the special period in Cuba. The Cuba Reconciliation Act, however, is unlikely to get much traction, especially with ultra-hardliner Representative Ileana Ros-Lehtinen (R-FL), chairing the House Foreign Relations Committee, and her counterpart, Robert Menendez (D-NJ), who is about to lead the Senate Foreign Relations Body. Some of the anti-Castro Cuban American community would likely view any of the three measures advocated here as a capitulation to the Castro brothers. But as we have argued, a pro-democracy and humanist position is not in any way undermined, but might in fact be advanced by détente. An end to the embargo has been long overdue, and the judgment of history may very well be that it ought never to have been started.